You only get to set a first impression once. The front of your home is this first picture any potential buyer will see on your listing. The first picture impression is what is going to send prospective buyers to the next listing or keep them wanting more. Here are 7 tips to help up your curb appeal and keep buyers interested! Hanging Baskets are the perfect addition to any entrance way. Plating a verity of different colored flowers around the home will add a nice touch to any home front. 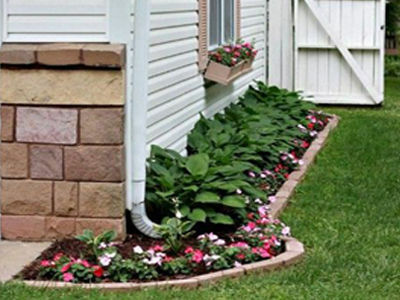 Edging landscaped flower beds allows the features to appear clean and finished. Tree rings are becoming increasingly more popular. Featuring a bed of flowers or other plants around the tree will add to the clean and maintained look on your home front. 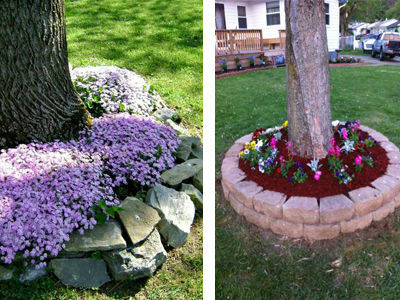 Try adding a stone outline to your tree ring flower bed for an upscale feel. It is always a pain to have to deal with your gutter hoses and extensions, try finding an appealing and functional route to push water away from your home. Did you know just how many options you have for your house numbers? Get creative with your numbers to help keep the buyers attention. A well lite entrance way omits a safe feeling for potential buyers. Adding lights to your walk way will not only be safer for walking guests but give your home a nice ambiance. Upgrading your outdoor sconces will also increase the look of your home front. There are many different styles to choose from for your entrance walkway. Currently it is popular to add stone style pavers versus concrete. No matter the direction you go, adding a nice finished looking walkway is going to make for a great start to the buyers showing experience.